Fear paralyzes. It wraps its tendrils deep in your mind and claws at your sanity, eroding your will to fight back against the horrors that lurk in the night. But if the world has any hope of standing against the unknowable eldritch abominations on the periphery of reality, brave souls will have to shed this fear and take a stand in order to save themselves… and the world. 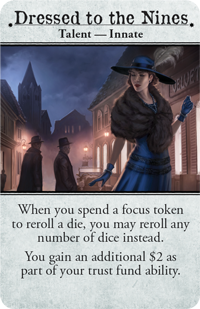 Join us today as we preview how your investigators can fight back against the darkness in Arkham Horror Third Edition! 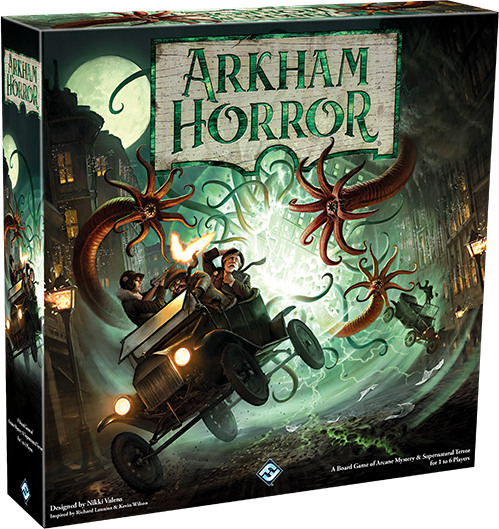 Arkham Horror Third Edition is the newest edition of the classic cooperative board game of cosmic horror. 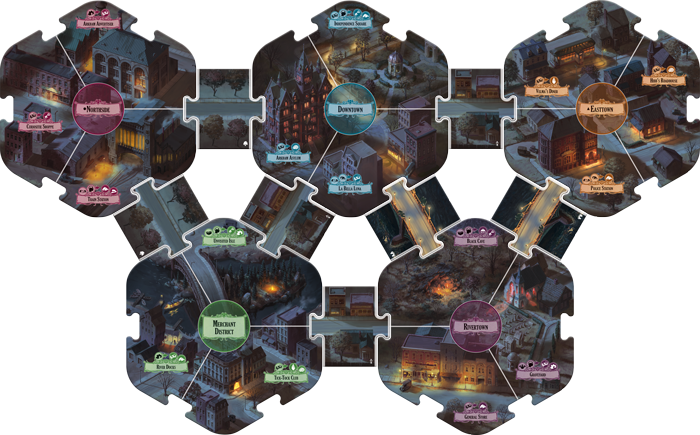 Today’s preview will cover investigator setup and the action phase, and you can join us every Friday to unravel more of the mystery behind the bizarre city of Arkham! The world of Arkham Horror features nightmares from beyond your imagination—Ancient Ones that exist outside of time and space invade our reality, threatening to rip apart this world. Only you and your fellow investigators stand against this unknowable darkness. But you won’t be defenseless. 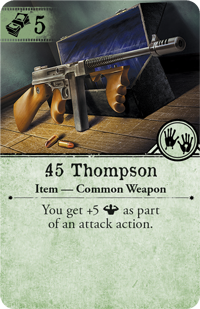 Throughout the four scenarios featured in the game, your investigator will gather possessions to aid them in their fight against the unknown, and your choices begin before the game even starts. 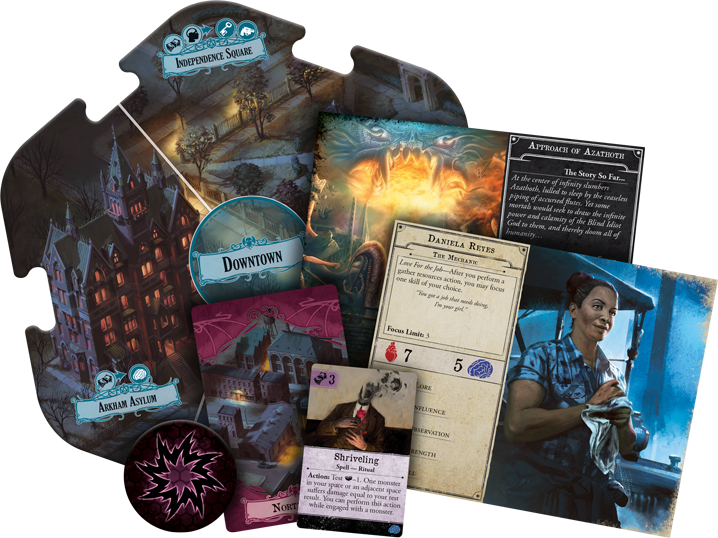 Not only will you choose one of twelve investigators to play as during your time in Arkham, but you’ll also get to customize their starting kit, allowing players to tailor their experience between individual investigators. For example, Jenny Barnes begins the game with Search for Isabelle and $5, but can also choose to start with either Dressed to the Nines or Jenny's Twin .45s. 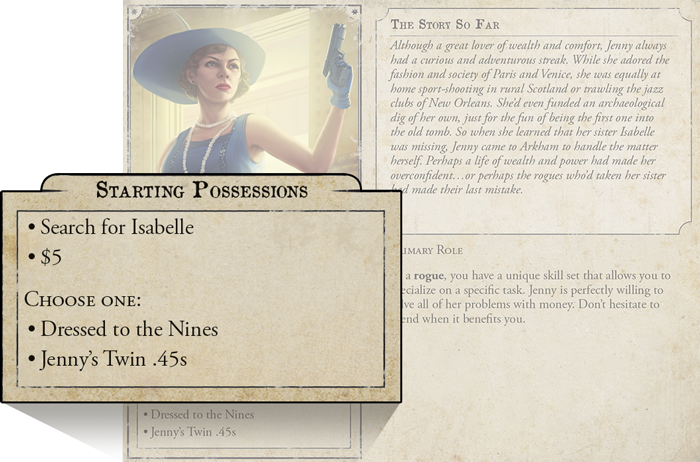 Dressed to the Nines allows Jenny to gain additional money with her Trust Fund ability, freeing her to purchase even more items and skills that could be vital to victory. It also allows you to reroll all of your dice when you spend a focus token, rather than just a single die. By choosing Dressed to the Nines, you're picking a more supportive role for Jenny, with a way to overcome any skill test and enough resources to buy items for any situation. 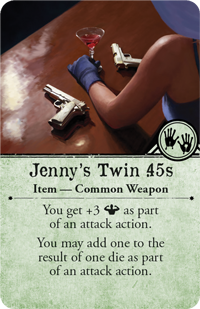 On the other hand, Jenny’s Twin .45s may suit the taste of a player who enjoys hunting nightmares. The guns dramatically increase your strength during an attack, and let you boost the value of one of your dice. Together, this almost ensures the .45s will never fail Jenny, and the horrors that lurk in the night have their own monster to fear. Over the course of your games of Arkham Horror Third Edition, you will gain additional allies, spells, and items to help you to combat the evils of the mythos—further curating and strengthening your investigator. But no matter how you choose to play, your journey is just beginning and it’s time to explore the dark, twisted world of Arkham Horror. You won’t fend off the darkness while standing still: exploring Arkham is essential to victory. During their turn, a player can perform two different actions, and every action you take is important to advancing your cause. You'll always have the opportunity to move about Arkham with a move action, getting closer to neighborhoods full of clues, or bravely advancing on areas under the influence of an Ancient One, full of doom and terrifying monsters. With a fully modular board composed of large, double-sided neighborhood tiles, each of the four scenarios has a unique board layout, ensuring a different play experience in every game. But why move about Arkham? What hope is there in the face of such all-consuming evil? 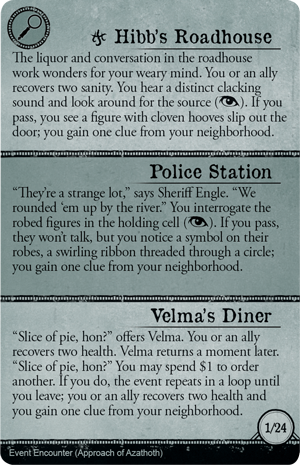 If you have any hope of defeating the ancient evils encroaching on Arkham, you must first understand their plans by collecting the clues that lie scattered around the city. By moving to a neighborhood featuring a clue, you may find yourself having an encounter that could lead to you discovering this clue. Once you've gained the clues, you may use a research action to interpret your findings and store your clues on the scenario sheet, inching you closer to finding a path to victory. These encounters won’t be easy, however, and many encounters will require you to perform a skill test. Perhaps you need to convince a police officer to let you interrogate a mysterious prisoner, or maybe you have to escape a repeating time loop. Nobody said collecting these clues would come easy, and your investigator will have to deal with challenges both natural and supernatural to unravel the mysteries of Arkham. 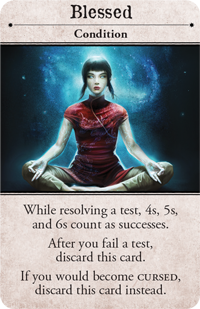 A skill test sees one of your five skills put to use. To perform a skill test, you'll simply roll a number of six-sided dice equal to the appropriate skill value. If any of these dice roll a five or a six, you succeed! 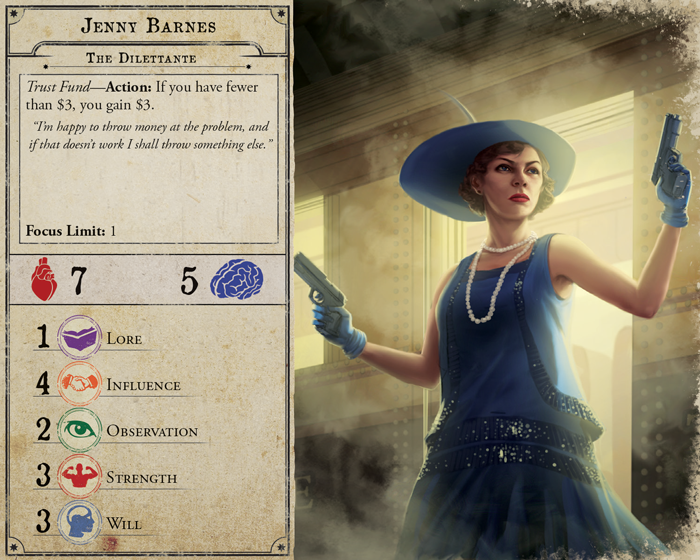 Jenny Barnes is making an influence skill check to try and grease a few palms and get some information on the mysterious robed figures roaming about town. With an influence skill of four, she gets to roll four dice. Two of these dice roll a five or six, meaning she easily succeeds! After you’ve collected these clues, your investigator must try and make sense of the disparate hints they’ve collected with a research action. To perform a research action, your investigator will have to make an observation test, moving one clue to the scenario sheet for every success they roll! Researching your findings to place these clues on the scenario sheet is one of the main ways you can advance, tipping the scales of fate in favor of the investigators. But the darkness fights back, and as investigators discover clues throughout the city, doom spreads to the neighborhoods of Arkham. Doom represents the maturation of the Ancient One's plans, and can add new codex cards that harm investigators. Perhaps cultists worshipping this ancient evil take to the streets, or perhaps the Ancient One itself begins to merge with reality. Luckily, you can ward off this doom, giving investigators the time they need to succeed. Any investigator may perform a ward doom action for their neighborhood by making a lore test. For each success they roll, they may remove one doom from their space. While this doesn’t directly advance your investigation, it's desperately important to provide a shield against the overwhelming darkness. Warding multiple doom with a single action also rewards you with a remnant—a piece of the otherworldly which you may use to fuel your own powerful spells. These are just a few of the actions you’ll take during your turn. You can also gain money to buy new items and skills, trade items with other investigators, focus a skill to make it more effective, attack or evade an enemy, and more. We’ll explore these actions in the coming weeks, as well as previewing the other phases of the game and how to deal with the horrifying cultists and creatures of the night that lurk the streets of Arkham. Become a shield against the darkness with Arkham Horror Third Edition (AHB01), available now for pre-order from your local retailer or our website! As of 12 p.m. CST on 10/23, the Arkham Horror Third Edition Deluxe Rulebook is officially sold out!